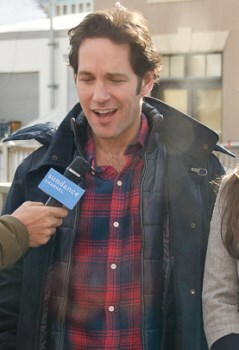 Paul Rudd, the actor best known as Anchorman field reporter Brian Fantana, is set to star as Ant-Man, the superhero best known to pretty much nobody. Batman. Iron Man. Spider-Man. Ant-Man. One of these things is not like the others. Seriously, who's going to stand in line for Ant-Man? A guy whose power is getting really, really small - and it's not even a power, it's just some goof juice he cooked up in the lab. And his ability to control ants? Wow, dude. You make Aquaman look positively god-like. Anyway, this is apparently where Marvel is on the list of "Superguys Who Haven't Been In a Movie Yet," and to be fair they don't seem to be half-assing it. Both Rudd and Joseph Gordon Levitt were reportedly in the running for the part (Levitt may have bailed in favor of the recently-announced Sandman project) and while Rudd isn't exactly known as the rugged superhero type, his comedic abilities and charisma might be just what the character needs to make him interesting in ways that don't involve backhanding his wife. Edgar Wright, who directed the "Cornetto trilogy" - Shaun of the Dead, Hot Fuzz and The World's End - and Scott Pilgrim vs. The World, is signed to direct and also co-wrote the script. But back to the original question: Why Ant-Man? He's a second-string Avenger at best and he's not even really a "he" at all: Logan is Wolverine, Peter Parker is Spider-Man, Tony Stark is Iron Man but Ant Man is just whoever happens to slap on the suit and swallow the pill at any given moment. I don't want to come off as too negative (am I being too negative?) but Ant-Man? Seriously? Ant-Man: Be Careful Where You Step (which may not actually be the official subtitle) is currently in pre-production.